as other projects and grants we fund throughout the year. that is typical to this special event. We will have many silent and live items for guests to bid on, a list will be available shortly for you look at in advance. 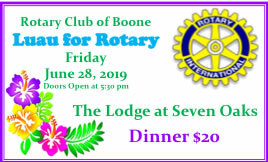 Tickets are available from any Rotarian or by emailing booneiarotary@gmail.com in advance. They will also be available for purchase at the door. We hope to see you there!!!! !